When I think about what our customers are trying to accomplish, it reinforces how critical our job is as a steward for their data. Many are still early in their transformation, and even the most advanced organizations won’t have a clear line of sight to where their data needs will be years out. As I’ve previously noted data doesn’t have an expiration date so there’s a need to support the future needs that cannot be anticipated, while extending the support for the existing data collected over time. This requires a data platform that offers longevity and scalability while continuing to deliver the innovations necessary to meet new business needs. Nowhere are these challenges more pronounced than with unstructured data; which is information that doesn’t have a pre-defined data model or organization and can come from many sources including documents, video, social media, images, or devices. 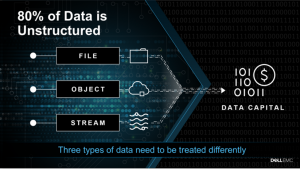 There are three common forms of unstructured data: file, object, or streaming data each has its own characteristics and uses. Most organizations now know the potential their data has, but they’re often weighed down with legacy infrastructure that makes it difficult to tap into all that data. Unlike structured data that resides in a database, these file types are elusive to extract value from; this is where we’ve set our sights to solve these problems and help accelerate Digital Transformation for our customers. For many vendors, consolidation means re-platforming of legacy applications and a radical shift that often requires disruptive migration – often to the cloud. We see the unified data lake as a way of eliminating data silos that exist within an organization while providing support that spans the entire data footprint from edge to core to the cloud. With solutions that account for all the unstructured data types and provide a foundation for the existing legacy applications, the business relies upon as well as new cloud-native apps. When we begin to talk about the massive scale that is necessary to leverage Data Capital across an enterprise, the data platform must be able to scale performance and capacity on-demand to keep up with the data proliferation. Even when organizations can keep up on the infrastructure side, the management of a global data footprint can quickly tie up resources and lead to inefficiencies. We deliver control that scales into Exabyte range, with simple policy-driven data automation, allowing organizations to focus on extracting value from their data – instead of just managing it. Some would see data analytics as the sole way to create value from data, but this is a narrow definition. 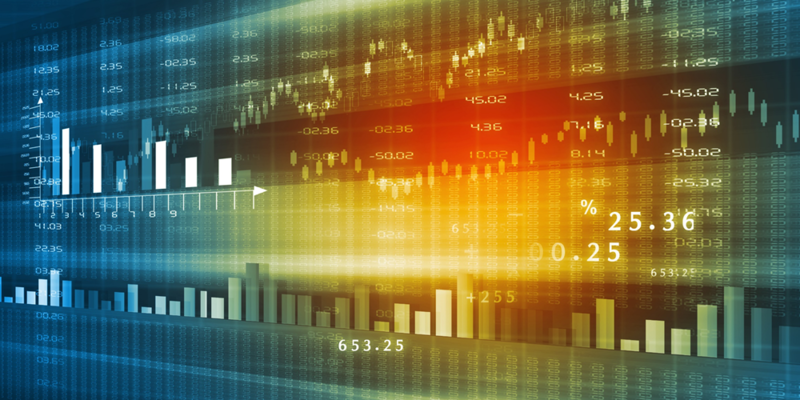 When we talk about Data Capital, our focus is on enabling new digital experiences, bringing efficiency to workflows, as well as the insights that can be uncovered from data analytics. It’s important to see the extent of the value that can be unlocked here; take media and entertainment, for example, on-demand viewing has opened up new revenue streams and created strong competitive differentiation to organizations that led the charge into digital content delivery. We built a platform that can deliver not just insights, but the digital experiences themselves, to enable our customers to get the most value from their data. If you’re eager to begin your journey toward unlocking your Data Capital, then I hope you’ll join us at Dell Technologies World in Las Vegas this April 30-May 3. We’ll have a series of informative breakout sessions focused around planning for the future of your business, maximizing performance from your storage solution, and optimizing for extreme scalability. You can also take the products for a test drive at the hands-on labs; learn about Data Capital in action – hear about customer successes at the solution expo booth; and have 1:1 meetings with our experts and architects throughout the show. If you’re unable to see us there, you can still follow the action: @DellEMC, @DellTechWorld, #DellTechWorld. And be sure to visit: www.dellemc.com/datacapital to learn more about how you can begin your journey.